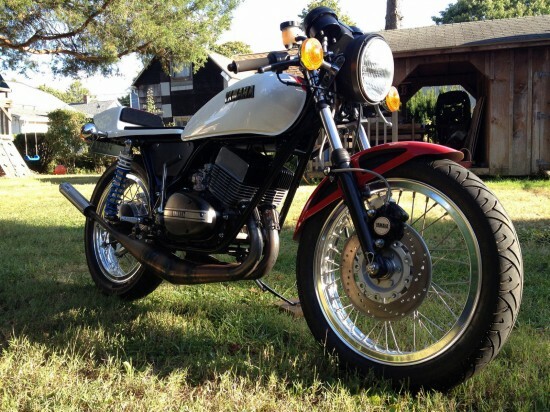 Another really nice little Yamaha RD350 with some subtle custom touches that can be easily reversed if a potential buyer would prefer something a bit more stock… I love a nice, subtly modified bike that enhances the bike’s original strengths and this is very simple, but still looks like the original article. This build includes an uprated engine and suspension updates that should provide excellent handling. While Kawasaki was busy building hairy straight-line rockets and Honda was busy making bikes Swiss-watch internals at everyman prices, Yamaha was creating its own niche, building middleweight two-strokes that provided a very complete package that included that elusive quality: handling. 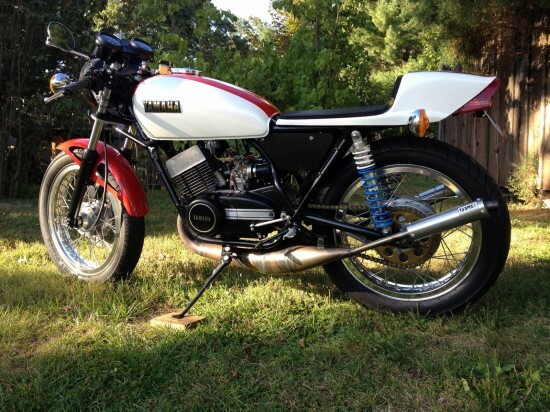 This 1973 YAMAHA RD350 has fewer than 200miles since rebuild. 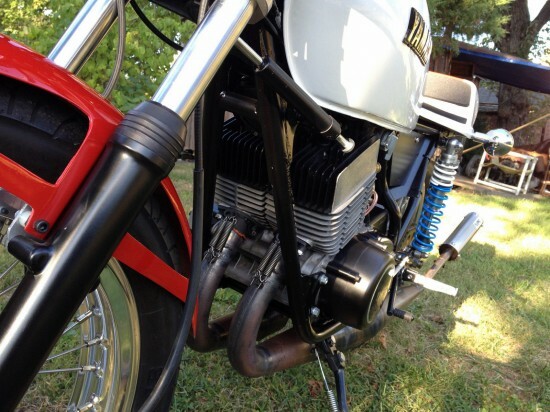 starts easy and has that awesome two-stroke sound coming out of the spec2 chambers! EVERYTHING was completly disassembled, rebuilt, painted or polished. The crankshaft was rebuilt, stage 2 porting, larger RZ intakes,32mm mikuni vm jetted for pre-mix, I have the work orders from spec2 with all the details. Franks fork tubes with racetech springs and cartridge emulators up front and works performance shocks out back. the rolling chassis went to G.M.D. 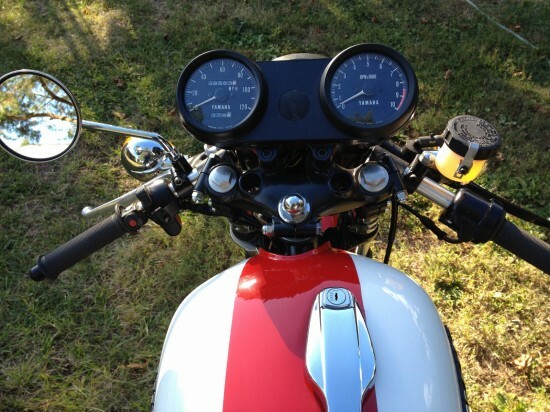 computrack to check alignment, yup… it handles awesome! Fuel tank is N.O.S. 77 yamaha SX, along with a ton of nos,oem, and performance rd parts.I have just over $10,000.00 in receipts, they will go with the bike for future reference of suppliers used for the build. With a $3,200 starting bid and just two days left with no takers, I’m a little surprised. I’m not an expert on these so I can’t speak to its originality, but it seems to be a very well-prepared little bike that really captures the spirit of the era. 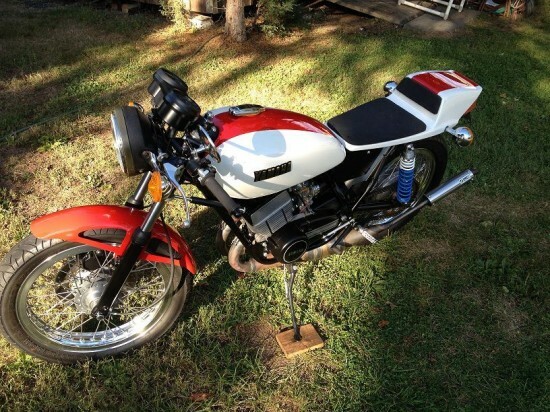 Luckily, I don’t have a spare $3,200 lying around to buy another bike, but I’ve been aching to buy into the two-stroke club, and this looks like one that would tempt me. Very nice build! 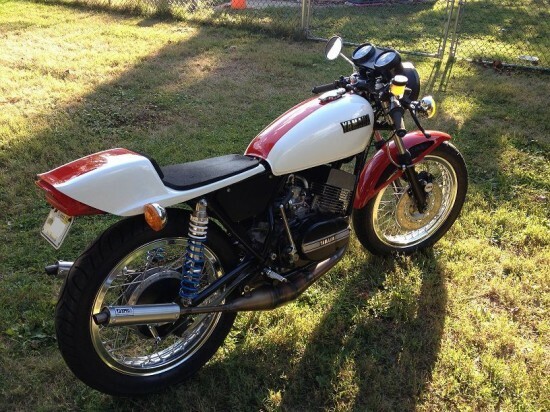 This guy appears to know how to build a “proper” cafe racer. Not some cobbled together, breakless, fenderless, rolling wreck. Plus, he obviously knows Yamaha’s international racing colors were “red and white” back in the day. Since this is a “no reserve” auction I believe there will be alot of bidding in the last 5 minutes, if it isn’t sold before then. For some reason I can’t post anything on Rare Sort Bikes For Sale. Is there anything I should do? Not sure what the problem is. Maybe there’s a delay in the approval process? As far as I know, commenting is still turned on for the site. Yeah, I’d really love to get a bike exactly like this one. From pictures, it seems very nicely put together, with subtle upgrades that enhance the look and function.